UPDATE REHOMED....surrenderMeath Dog Shelter 1 hr · TINY REF 330 SURRENDERED due to not being able to find new accommodation that will accept dogs. 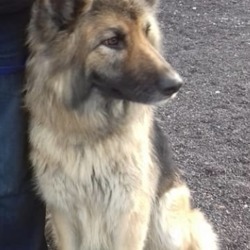 Tiny is 3yr old female GSD cross. House trained but been living outdoors in recent years. Pulls on lead. She is a very happy friendly loving dog. Good around dogs she has met. Phone us 0870973911 or call in Mon-Sat 10 till 2.30pm.